Why Is Baseball Practice So Boring? If you’ve ever watched or been involved with a youth baseball practice that was slower than watching paint dry, you’re not alone. Probably what you witnessed was a youth pitcher, who doesn’t pitch well, throwing to a youth hitter who doesn’t hit very well, with everyone else standing around waiting for something to happen. You have seen it before — the outfielders are sitting down, the shortstop and the 3rd baseman are having a rock fight, the 2nd baseman is playing catch with his glove, and the 1st baseman is drawing pictures in the dirt with his right toe. Meanwhile the coach is trying to explain to the pitcher how to get the ball over the plate, and the assistant coach is trying to explain to the hitter all the reasons why s/he is missing 4 out of 5 pitches. The problem here is that only 2 out of perhaps 10 to 15 players are actually doing anything. After about 10 minutes of this they can’t wait to go home. Baseball practice doesn’t have to be dull. Solution? Get everyone involved at once. Here are a fielding/throwing/running drill and a batting drill that both do just that. Align 2 parallel baselines about 15 feet apart. Put 3 bases on each one of those baselines, one at each end and 1 in the middle, in a straight line. Divide your players into 2 teams. If you have an odd number of players, do yourself a favor and have some fun by becoming a team member. Each team lines up at the same end of one of the baselines. Each team has one baseball. Place the baseball in the hands of the 2nd player in line. On “go”, the 1st player runs to the middle base, stops, turns, and player 2 tosses the ball to player 1. Player 1 tosses the ball back to player 2, turns and runs to the 3rd base. Player 1 turns and faces player 2. Player 2 throws the ball to player 1, who promptly throws the ball back to player 2. Player 2 promptly turns and hands the ball to player 3. Player 2 then runs to the middle base, whereupon player 3 tosses her/him the ball and the whole process repeats. When the last player in line has received a return throw from the end base from the player in front of her/him, s/he runs the ball to the end base and hands it to the original player 1. At this point, the whole process repeats in reverse. The objective is to move the entire line of players down the baseline and back to their original position in line. First team to accomplish this gets a point. Usually 3 out of 5 is a good way to determine a winner. This is a great game that forces all players to perform 2 out of 3 of the most important skills of baseball under tremendous pressure and is tons of fun. If you’ve got players who don’t catch and throw well yet, use a softer ball to avoid injury. This drill requires a bucket of about 3 dozen wiffleballs – not a huge expense and well worth it. Place your entire team in a circle large enough so that no player is close to another on both sides. You need enough clearance for each player to be well out of reach of a swinging bat on both sides. Each player has their own bat, not a wiffle bat. The coach stands in the middle of the circle pitching to each player in turn. The goal for each player is to hit a line drive across the circle at the player across from them. All players retrieve the balls when the bucket is empty. While these drills are for baseball, the same principles apply for other sports. You can transform your practices into events that your kids will look forward to by getting everyone involved and making sure everyone is moving at all times. 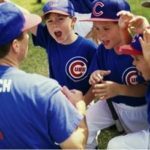 Younger kids learn best by doing, not listening to the coach talk.